Whether you work as a contractor, handyman or landscaper, having a jobsite radio could make your life a lot more entertaining. Jobsite radios are the best way for crews to get access to music or the radio. The issue is that most job sites involve a lot of moving parts and destruction. A typical construction site has objects flying around everywhere. With so many tasks and a difficult day at the jobsite, a radio provides a little entertainment and joy to your day. Such a device can improve your productivity and energy levels. 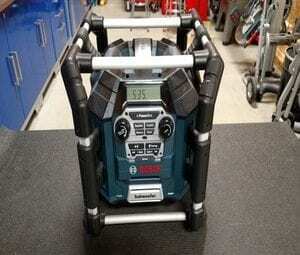 While listening to one can prove to be relaxing, buying a jobsite radio isn’t an easy task. You’ll have to determine the audio quality, durablity of the device, connectivity, and what type of batteries you’ll need (Source). We created a list of the best jobsite radios on the market to make your life easier. These top five products will offer great sound quality, connectivity, durability and other must have features. 7.1 Do I Need a Jobsite Radio? 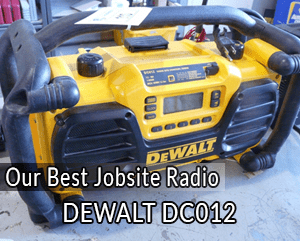 The DEWALT DC012 is the best jobsite radio for the money. It offers all the durability, connectivity and extra features that one could desire from such a product. It is possible to use the DC012 with its power cord, but it also works off 12V to 18V batteries. The DC012 is a cordless radio that you can take to any jobsite without worrying about it getting damaged. The jobsite radio has a special charge system that is designed to top up the battery very quickly, meaning that you can quickly get back to using it even if it is low on charge. The sound quality is very good, with high efficiency weather resistant speakers. There are dual bass ports for added punchiness on bass-heavy tracks. With aux connectivity, it is very easy to get music going from your smartphone, iPod or other media consumption device. Protective aluminum and rubber roll cage ensure durability. Both weather and dust resistant. Loud stereo sound with 360 degree projection. In terms of pure sound quality and connectivity, the Bosch PB360C is one of the best options around. 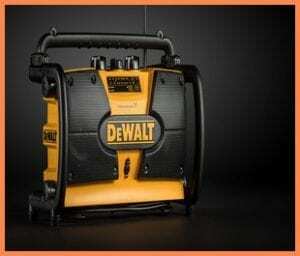 It has four speakers with a subwoofer, ensuring loud and booming sound across a big jobsite. It offers both Bluetooth and AUX connectivity. Those who prefer going wireless when connecting a smartphone to their jobsite radio will love this product. It has all the relevant AM and FM channels, much like all the other jobsite radios in our list. The manufacturer advertises the battery life as five to eight hours, which is very good for a regular workday. It is possible to plug this in and charge it at the same time. It is easy to change settings or volume with the onboard buttons and small LCD screen. The body is made of aluminum and it has a rubber roll cage for added protection. It is weather and dust resistant. The only downside to this radio is that it is 24 pounds, comfortably the heaviest on our list. Very good sound quality and volume. Both AUX and Bluetooth connectivity. Very heavy at 24 lbs. 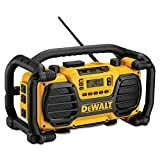 Another offering from DEWALT, the DCR018 is a very good option for those who want a compact and lightweight radio for the jobsite. Those who are often moving around different rooms or outdoor areas will like this radio, as it is so simple to pick up and move around. It will run on 12V/18V/20V battery packs. It also runs off a power cord, which is very handy if you run out of battery during a long day at work. There is a USB port that allows for charging while the device is plugged into the wall and in use. 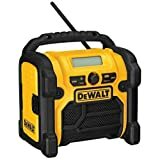 Thanks to the AUX connection, it is easy to use the jobsite radio with a smartphone, iPod or other media consumption device. Sound is crisp, clear and loud, but the bass is not as great as some of the larger devices on our list. The body is weather and dust resistant, ensuring durability at any jobsite. Runs off both batteries and AC power. USB port means it is possible to use and charge at the same time. Features an AUX connection for smartphone compatibility. 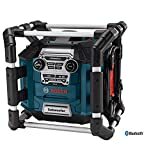 The lightest jobsite radio on our list at only 4 lbs, the Bosch PB180 is a tremendous option for people who prioritize weight over any other feature. And the good news is that it still sounds very good. The PB180 comes with two 5-watt neodymium speakers that deliver impressive performance. While it will not get as loud or have as much bass as the larger models, it is still very respectable and can fill up a moderately sized area with quality music. With the PB180, you get very good radio reception for both AM and FM signals. There are 10 preset options that you can customize with your favorite stations. It has a massive seven meter antenna so you will always get great signal, no matter where you are working. The shock absorbing housing means that even a few drops will not cause this radio any problems. It can survive a two meter drop! But it is not weather resistant, which means it is the type of radio that is ideal for indoor job sites – or when it is not raining! It will work off the 18V battery, while it also comes with an AC adapter. The LCD display will show the time and other settings, which can be easily adjusted with the onboard buttons. Lightest jobsite radio on our list. Very durable – can survive two meter drop! Low volume and bass compared to bigger radios. Running of 18V batteries, the Makita XRM04B can go up to 20 hours depending on the battery that you choose. The sound quality is also very good, as it delivers rich sound through its two side-firing speakers. With a protective bumper design, you do not have to worry about this jobsite radio being damaged if it falls. It is very durable and will last for a very long time. And thanks to that 20-hour battery life, you do not even need to bring the cord if you remember to fully charge it the night before. It has a big LCD screen and buttons that are very easy to use. Changing radio presets or audio sources is very easy. The AUX connection means that you will be listening to music from your smartphone within seconds on this radio. The XRM02W has a unique design with a very big handle, meaning that it is easy to carry around, even if it is 10 pounds! Up to 20 hours of battery life with certain batteries. Good sound quality through two side-firing speakers. Do I Need a Jobsite Radio? There is no necessity to use a jobsite radio if you work in construction or a similar profession. Some people prefer to listen to music on their own, using wired or wireless headphones. Others may bring a regular radio with them to work. But there are drawbacks to those approaches. If you are wearing headphones, you are less likely to hear your fellow crew members or anyone else in the area. You could be more likely to get in a workplace accident. And regular radios will do the job, but only for so long. They are not made with durability in mind. And they are certainly not meant to be used outdoors for six to eight hours a day! Jobsite radios are built with the rugged outdoors in mind. It is also true that many regular radios or CD players are wired, which means that you will need to find an electrical outlet each time you want to listen to music. Such issues are not present with jobsite radios, as they are able to run off batteries. Not every indoor or outdoor jobsite is the same. Depending on where you work, it could be quieter or very noisy during the day. If you are working in a noisier, busier environment, a heavy duty jobsite radio will be the best bet. Those get very loud and they are extremely rugged. A quieter jobsite that often involves work indoors means that a more sleek and stylish jobsite radio will be sufficient. Those radios are still durable and packed with features appropriate for heavy use, but they are not as heavy duty as some models. And they may not reach as high a volume, compared to the heavy duty jobsite radios. The music landscape has changed a lot over the past decade. Streaming is the new king where music is concerned. If a jobsite radio has bluetooth connectivity, it would be possible to connect someone’s smartphone to the radio. It would allow you to play music off a streaming service such as Spotify or Apple Music. You can also use an aux cable to connect an MP3 player, iPod or smartphone to your jobsite radio. In this day and age, it does not make sense to buy a jobsite radio that has neither Bluetooth nor aux cable connectivity. It is important to have the option of connecting a smartphone or other music-enabled device for access to streaming services, podcasts or other online media sources. While bluetooth is a positive feature in any jobsite radio, it is not a must. Many workers prefer connecting someone’s phone or iPod using an aux cable, as walking around on the job can often mean that a bluetooth connection cuts in and out, disrupting the listening experience for everyone. When you are selecting a jobsite radio, audio quality definitely matters. There is no point spending money on a radio that crackles every time it reaches a moderately loud volume. But buyers should also understand that no jobsite radio is going to deliver audiophile-level sound quality. It is the nature of the product, as it will prioritize loudness and durability over pure sound quality. That does not mean audio quality is unimportant. 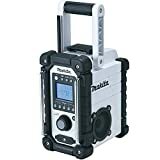 The best jobsite radios do sound very good, especially when connecting to a music streaming service through Bluetooth or an aux cable. All the jobsite radios on our list are cordless, meaning they can used with batteries. Every product will indicate the type and model of batteries that it supports. And they will not come with those batteries included, which means they are a separate purchase that you must make if you wish to use the jobsite radio cordlessly. A jobsite radio should be built with durable materials, especially on the exterior. Whether the radio is thrown around at a job site, subject to rain or in the blazing sun all day, it should still keep working years later. The best jobsite radios will be advertised as water and dust resistant. They will also come with a lengthy warranty, should anything go wrong. It is amazing how much difference you can make to a job site with a bit of music or radio entertainment. Everyone on the crew will be in better spirits. Whether you are working alone, in pairs or with a larger group, having a jobsite radio takes some of the dullness out of the job. Instead of feeling like it is another mundane day, you get to listen to upbeat music or radio shows while you work. All of it is possible if you buy one of the top jobsite radios on the market. Those who want all the best features will love the DEWALT DC012. 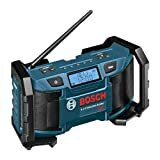 Those who want bluetooth connectivity can go for the Bosch Jobsite Radio PB360C, while workers after a lightweight model will love the DEWALT DCR018 or Bosch AM/FM Radio PB180. We hope our guide has made your purchasing decision a little easier. And if anyone has experiences with these or other jobsite radios, feel free to leave a comment below. We love hearing from our readers about their experiences with the products we recommend.